First Defense® is a versatile stormwater separator with the highest approved flow rates in the United States, enabling engineers and contractors to save site space and projects costs by using the smallest possible footprint. It also works with single and multiple inlet pipes and inlet grates. It is easily maintained from the surface by standard vacuum tanker. Designed with site flexibility in mind, the First Defense® stormwater separator provides versatile capture of sediments, trash and floatables that allows engineers to maximize available site space without compromising stormwater treatment level. First Defense® works easily with single or multiple inlet pipes and inlet grates, and is independently tested, verified and approved. New Jersey Corporation for Advanced Technology (NJCAT) at the highest verified flow rates in the US. New Jersey Department of Environmental Protection (NJDEP) at the highest certified flow rates in the US. The First Defense® reliably treats runoff from impermeable surfaces across a broad range of catchments. First Defense® also operates successfully as part of a management train alongside other proprietary or natural drainage features, for example as treatment before infiltration. As part of LID or LEED systems and Sustainable Drainage Systems (SuDS). Stormwater treatment at the point of entry into the drainage line. Sites constrained by space, topography or drainage profiles with limited slope and depth of cover. Retrofit installations where stormwater treatment is placed on or tied into an existing storm drain system. Pretreatment for filters, infiltration and storage. Use our online sizing tools to get the right unit for your stormwater treatment project. The First Defense® provides space-saving, easy-to-install surface water treatment in standard sized chambers/manholes. Variable configuratoins will help you effectively slip First Defense® into a tight spot. It also works well with large pipes, multiple inlet pipes and inlet grates. The First Defense® retains the pollutants it captures. The low-energy vortex separation of the First Defense® eliminates excessive agitation of captured pollutants ensuring that these pollutants are not washed out during subsequent rainfall events. Every First Defense® unit is delivered to site pre-assembled and ready for installation – so installation is as easy as fitting any chamber/manhole. Watch the animation below for an overview of how the First Defense® works. 1. Contaminated stormwater runoff enters the inlet chute from a surface grate and/or inlet pipe. 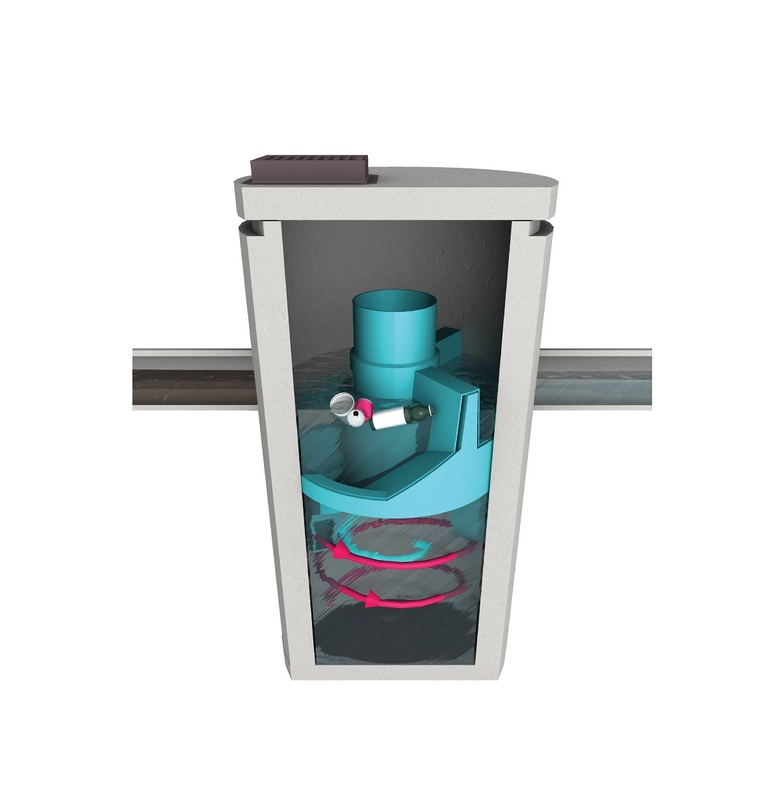 The inlet chute introduces flow into the chamber tangentially to create a low energy vortex flow regime that directs sediment into the sump. 2. Treated stormwater exits through a submerged outlet chute located opposite to the direction of the rotating flow. Enhanced vortex separation is provided by forcing the rotating flow within the vessel to follow the longest path possible rather than directly from inlet to outlet. 3. Higher flows bypass the treatment chamber to prevent turbulence and washout of captured pollutants. An integral bypass chute conveys infrequent peak flows directly to the outlet chute, eliminating the expense of external bypass control structures. 4. Floatables are diverted away from the bypass chute into the treatment chamber through the floatables draw-off port. A.In most cases, yes. Please contact us to discuss your requirements. A.Acceptable inlet/outlet pipe sizes range from 18" to 48", and vary by model size. Please refer to the Technical information section of the product page or contact us to discuss your requirements. A.Maintenance is safe and easy with a standard vactor truck, with no need to enter the space. Maintenance consists of removing sediments from the sump and floatable oils, grease, trash and other debris from the floatables capture zone. A.The unit size needed for your application depends upon a number of factors, including the level of treatment desired, the target pollutant, the water quality flow rate and the peak drainage system flow rate. Please contact us and we will be happy to discuss your requirements. The First Defense® High Capacity stormwater separator has been approved for use by the Ohio Department of Transportation. First Defense® helps engineers capture sediment and prevent stormwater discharge at a historic Massachusetts beach. First Defense® provides economical, small-footprint stormwater treatment to enable development in a constricted and already highly developed commercial area.